Climate change, increased global population, scarcity of agricultural land and rapidly changing consumer preferences collectively present serious challenges to our future food security. According to Associate Professor Kerry Wilkinson from the School of Agriculture, Food and Wine, these food security issues will only be overcome by a shift in food consumption habits, particularly with respect to meat consumption. The solution could lie with edible insects – and Dr Wilkinson is leading a research project focusing on consumer perceptions and attitudes towards a range of edible insects. Insects form part of traditional diets in many developing countries throughout Africa, South America and Asia, with approximately 1900 different insect species consumed worldwide. In Australia insect consumption is far from standard practice and tends to occur only as a novelty. This is a challenge for Australian producers attempting to promote edible insects within the domestic market. 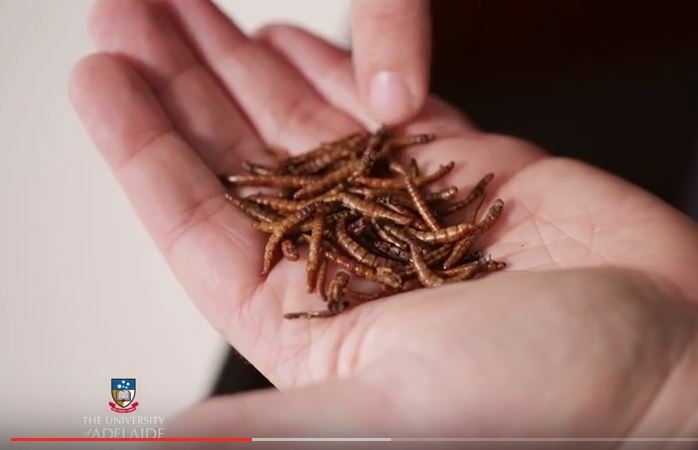 “To date, there have been few attempts to evaluate consumer perceptions of and attitudes towards the consumption of edible insects,” says Associate Professor Wilkinson. “To support this emerging agricultural industry, we are looking at ways of overcoming barriers to insect consumption in Australia and enhancing consumer acceptance of both edible insects and products containing insect-based ingredients. The research team is heading to the Central Market on June 8 and 9 to hold a consumer tasting. Participants will be able to try a selection of products including roasted crickets, mealworm cookies and cricket protein bars. All tasters will receive a Wallis movie voucher for participating!! !